GEO♦SKRIM® R12BB and R12WB consist of two sheets of high-strength polyethylene film laminated together with a third layer of molten polyethylene. The white outer layer (GEO♦SKRIM® R12WB) contains UV inhibitors and thermal stabilizers and the black outer layer(s) contains carbon black to enhance outdoor life. The white outer surface is also designed to reduce heat build up and condensation. 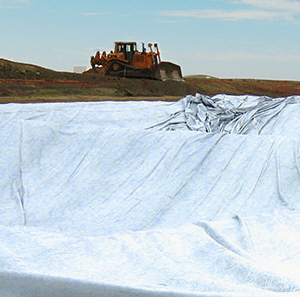 A heavy-duty scrim reinforcement placed between these plies greatly enhances tear and puncture resistance and increases service life. GEO♦SKRIM® is reinforced with a high strength scrim reinforcement laid in a diagonal pattern spaced 3/8” apart for uniform tear resistance in both machine and transverse directions.. Click here for Product Data Sheet.